From how to make pastry to the ethics of eating, Charlotte Wood inspires with her passion for food. The best food writers are those who delight in the preparation of good food and in sharing it with loved ones, and novelist Charlotte Wood is one such writer. In her memoir, Love and Hunger, Wood writes about her passion for cooking in the plain-spoken lyricism readers of her novels have come to love. It’s a privilege to be given an insight to another person’s passion and never more so than when it is presented with generosity. That Wood loves talking about food as much as she loves cooking shines from the page in the account of how she came to realise that cooking can be as much an art as writing or painting. Cooking, Wood says, ‘represents creativity in its purest form’, because it is free from the public evaluation writing attracts, and because a meal doesn’t have to be a spectacular performance: there is as much pleasure to be gained from a perfectly made bowl of spaghetti bolognese as from a crowd-pleasing soufflé. Wood also praises the pleasure to be found in mastering a basic skill like chopping an onion and — in the manner of all great home cooks — takes evident delight in sharing her techniques: her advice is calm and practical and easy to follow. Anyone who has despaired of ever making pastry successfully should read the chapter ‘A Pie in the Oven: overcoming fear of pastry’; Wood’s own patchy pastry history and the sensible advice she offers make good pastry suddenly seem achievable. Chapters on making chicken stock and roasting the perfect chicken might, at first glance, seem too simple to more accomplished cooks, but Wood moves beyond the recipes to expand on her philosophy of cooking. Getting back to the basics of cooking with a good home-made stock, she believes, can be the solution to a case of the cooking doldrums and can form the beginning of a well-stocked, inspirational pantry and freezer. The idea of a perfectly roasted chicken invokes visions of cosy family meals but, as Wood points out, many people find actually cooking such a meal ‘intimidating and stressful’ and sets about offering helpful ways to remove the stress and bring the pleasure back to a classic, comforting dish. That Charlotte Wood has written Love and Hunger with much warmth and consideration truly comes to the fore in her chapters on the ethics of food and eating — on picky eaters, eating offal, and on the pain of knowing half the world is starving while Westerners have a glut of excellent produce. Wood believes that being a picky eater ‘dooms a person to the same worn rut of experience’ and that this discourages them from trying new experiences at the same time as their restrictions dampen the pleasure of others when eating communally. Reading Wood’s adventures in eating offal directly after a chapter about picky eating certainly puts one’s disdain for Brussels sprouts into perspective: here is the audaciousness of a true food lover, boldly testing her mettle against dishes involving tripe, lungs, brains and intestines. The discussion of hunger in developing countries and our responsibilities towards the starving that follows is uncomfortable to read but clear-eyed and sensible nonetheless. Wood’s open and thoughtful approach allows us to acknowledge the shortcomings, prejudices and blindspots in how we eat, and in doing so encourages us to think about making changes to our own habits that may inspire us to find ways to help people in less privileged countries. 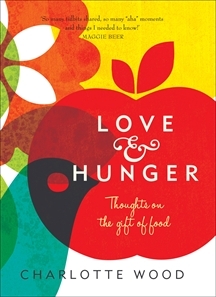 Throughout Love and Hunger, Charlotte Wood refers to the idea of food as consolation, and she writes thoughtfully on why this is so and how a gift of food, even in the worst of times, can bring comfort and a sense of community. Wood shares her own experiences of the kindness of the community in providing gifts of meals when her parents were ill and, from this experience, gives thoughtful advice on offering meals to the carers of people who are sick — even if that means simply leaving a casserole on their doorstep. Such gifts are as much about solace as they are about food: offers of food are not charity but are instead born of the need to be useful and of wanting to express how much you care for someone who is suffering. Practical advice abounds in this final section of the book, including tips on cooking for older people and for people undergoing chemotherapy, as well as food safety guidelines to consider when transporting meals. Wood also provides an excellent chapter on sending food through the post for those occasions when you aren’t able to just pop round. Charlotte Wood writes so openly about her cooking habits and history and her thoughts about the ethics of good eating that it’s impossible not to be swept up in her enthusiasm. Novice and experienced cooks alike will find something to inspire them here, as Wood has included a range of wonderful, tempting recipes. Reading Love and Hunger is like being invited into Wood’s home, seated at a table crowded with delectable dishes and encouraged to eat until you burst. Kylie Mason is a freelance book editor (http://www.kyliemmason.com) also renowned for her baking.